Savor starry skies by night and the wind whispering through sunlit trees by day. Soak in the hot tub after exploring the mountains. 3 Minutes from Tubing and Waterfall Hikes. 10 Minutes from the Train. Have an authentic mountain cabin experience at Moonstruck at Deep Creek. 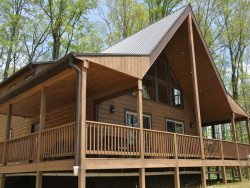 Nestled on a wooded mountainside, this two bedroom cabin has everything you need in an easy access mountain setting. The Deep Creek area of the Great Smoky Mountains National Park is a 3 minute drive with white water tubing, three waterfalls, and miles and miles of trails. Fishing and stand up paddle boarding on the Tuckaseegee River is less than 10 minutes from the cabin. 2 Bedrooms and 2 Baths. The Main Floor Bedroom has a Queen Bed and Private Bath. The Second Bedroom upstairs has a Queen Bed and a Twin Bed plus a Private Bath. The living room has a sleeper sofa. Both bathrooms have tub/shower combinations. Dinner doesn’t get any fresher than the picnic table on the covered porch. Kick back in the rocking chairs and enjoy the breezes through the trees. For Guest Testimonials, please click on the Review Tab. Loved the place. Great central location for day hikes and then dinner in town. Loved the place. Great central location for day hikes and then dinner in town. We will look to rent this location again. Everyone was incredibly helpful and kind. Awesome place! My 7 year old and 16 year old enjoyed exploring. We all had a great time relaxing together. We will be back!! We had such a fun stay at Moonstruck at Deep Creek We loved taking dips in the hot tub in the snow and had a great time hiking the Deep Creek Trails. We stay up late playing board games and loved using the kitchen to make meals. Looking forward to our next stay in the Smokys! The cabin was great. We loved the new restaurant The Warehouse. The cabin was perfectly located to the National Park. We can't wait to come back. We loved our stay here at this beautiful cabin! Everything was perfect! The waterfall was amazing as well as all the attractions. We will be back again soon. The thorough directions were very helpful, and I had a great experience every time I called. Beautiful view and amazing Smoky Mountain experience. Nantahala Brewer, Chocolate Factory, the Falls, Cherokee and the road to nowhere. But our favorite memories are the views from the hot tub. Thank you for our wonderful convenient stay. Our stay was very amazing. It was a great break from life at the moment. Thank you and can't wait to come back. We had a wonderful time. We drove through the Smoky Mountains, went snow tubing. The view was breathtaking. I couldn't explain how wonderful the scenery was. I had an amazing time and will come again. We always have a very relaxing time when we stay here and love Bryson City. Hope to be able to come back for many years to come. We enjoyed the cabin very much, and came down to visit for our 9th wedding anniversary. Very beautiful and quiet. We had fun visiting the waterfalls, the shops in Bryson City, we went horse back riding and rafting. This place is so beautiful. Can't wait to come back. Kelly was extremely helping in choosing the right cabin for my family and I.